The Model RE-2 Residential Telephone Entry System is designed for residential or light commercial access control applications. The speakerphone, keypad, radio receiver, and optional video camera are housed in a rugged enclosure that can be mounted to a pedestal, or bolted directly to a wall, or flush mounted in a column. 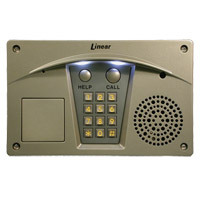 The diecast keypad keys have bright, easy-to-read graphics and are lit with an overhead light. The two operation buttons; CALL and HELP, are machined for heavy-duty reliability. **** Note: Shipping costs may vary according to the respected shipping weight, destination, cost of items and insurance of the package. Manual adjustment of shipping cost may be necessary in these situations.